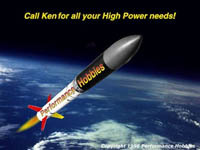 All reloadable rocket motor hardware is machined from high strength aluminum alloy. Motors can be purchased individually or as complete motor systems. RMS-38/480 - COMPLETE MOTOR "USED"
Includes 852 case, 1280 case, 1706 case and 2560 case. Plugged and open forward closures included with this package. Also includes one seal disk. RMS-98/7680 Serial Number 000 -1996 "USED"